This third volume in a four-volume set offers new theories and applications for the diagnosis and treatment of mental disorders. Having laid the groundwork in the first two volumes, the authors now embark on significant, real-life scenarios that apply their philosophy to mental disorder treatments. The goal of the project is to take the industry toward sustainability, not just in terms of the chemical engineering used to create medicines, but also environmentally, economically, and personally. 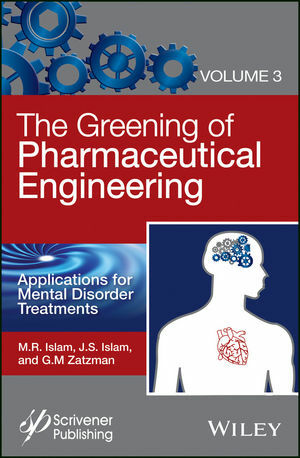 Their unique approach uses a more holistic and philosophically cohesive method for treating mental disorders, making the industry "greener" and the patient healthier. M. R. Islam, PhD is a world-wide consultant on environment and energy-related issues. Dr. Islam is known as the most published engineer in the world. He is credited to have coined terms, such as "green petroleum" and "sustainable petroleum development" at a time when "sustainable petroleum" was considered to be an oxymoron. Dr. Islam's most notable contributions are in the areas of sustainability, environmental integrity, and knowledge modeling, on which topic he has written dozens of books and over 700 research papers. Jaan S. Islam has been active in research on the topics of science and social science. He is a co-author of the theory of mass, energy, time, and human thought material that formed the core of a number of books, including the current series. His previous works include Reconstituting the Curriculum (with M.R. Islam & Gary Zatzman). Gary M. Zatzman has decades of investigative journalism and research experience, dozens of articles in technical journals, and four previously published books: Sustainable Resource Development, Sustainable Energy Pricing, Economics of Intangibles (with M.R. Islam), and Reconstituting the Curriculum (with M.R. & J.S. Islam).